With a piney, phenol-like, slight lemony flavor and taste similar to thyme, this aromatic spice has been used since ancient times in its native India. Commonly used in North Indian, Pakistani, Bengali, Ethiopian and Iranian cuisines, its natural affinity with starchy foods makes it an ideal addition to root vegetables, legumes, breads, snacks and green beans. 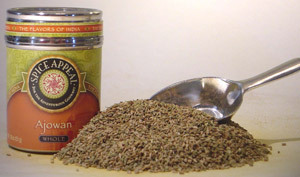 Goes well with curries and stews; provides an intense aroma and flavor to fish and seafood dishes.